First off, a Philippine pride, the Taho is one of my favorite snacks especially when it’s hot and fresh in the morning. Vendors usually sell these for breakfast. 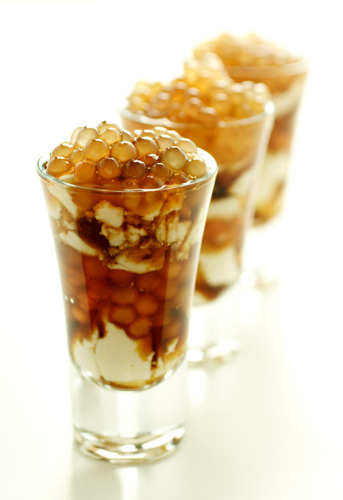 It consists of fresh silken tofu (custard made out of soy beans), brown sugar and vanilla syrup, and tapioca or pearls. I like this one best when it’s loaded with syrup. (sugar rush!) It also comes in Strawberry Syrup flavor but you can only have it in Baguio. 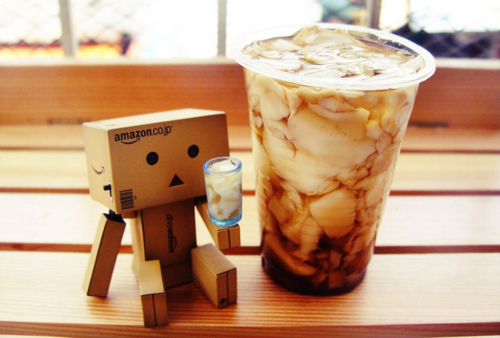 Here’s Danbo enjoying a small and gigantic cup of Taho. Cute! Now, we go all the way to South Korea to enjoy these addictive Melona Ice Cream bars. Over in Japan, we have lots of different kinds of snacks and you just can’t keep track of them. One of which has been famous here in Manila for quite a while now is Mochi. 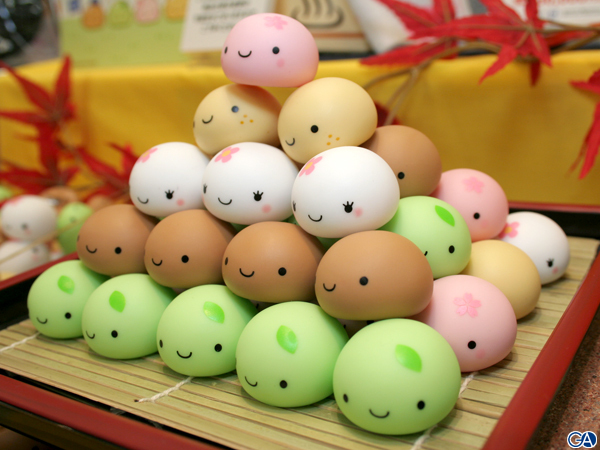 Mochi is a Japanese rice cake made out of glutinous rice which is then pounded into paste and molded into shape. Given the several uses for Mochi, it stood out the most as Ice Cream (flavored ice cream stuffed Mochi). It comes in numerous sizes, colors, and flavors. 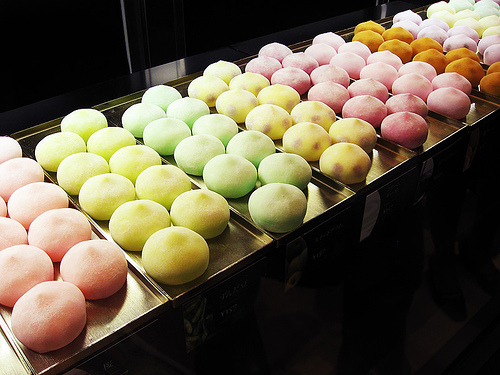 Some traditional ways of serving Mochi is by stuffing it with sweet filling instead of ice cream. Fillings can be of white bean or red bean paste and sometimes strawberry paste. 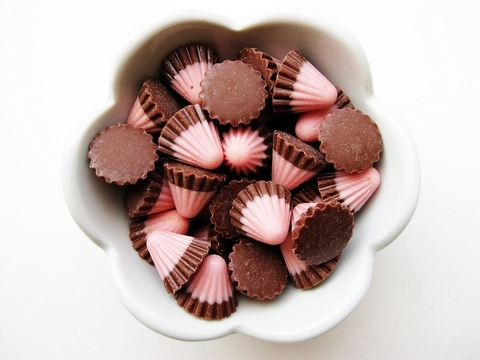 Another famous Japanese snack is the umbrella-shaped Strawberry Chocolate from Meiji. Simply put, this is the perfect combination of strawberry and chocolate in tiny packages. Imagine fresh strawberries dipped into melted chocolate..yum! Here are more of Japanese snacks, biscuits this time. 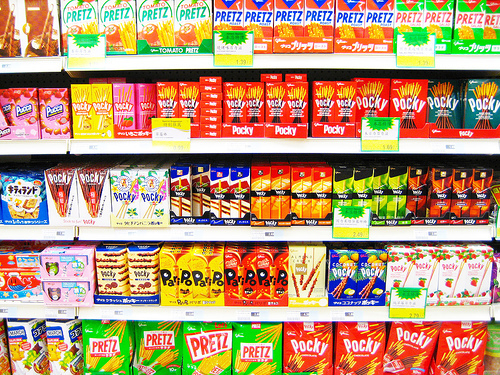 Pocky and Pretz are both manufactured by Glico and these are my fave on-the-go snacks. It also comes in numerous flavors and cute packaging. 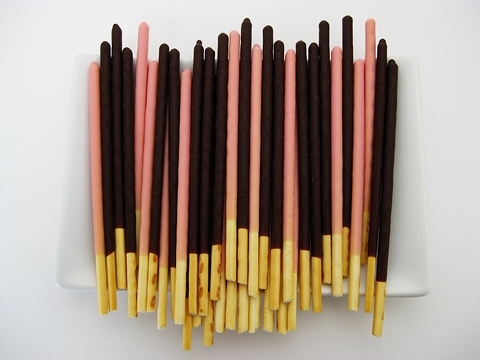 For Pocky, my faves are the Strawberry flavor and the Milk flavor. Last but not the least, we go to Hong Kong to enjoy some Eggette. These babies are my fave street food when we were in Hong Kong. 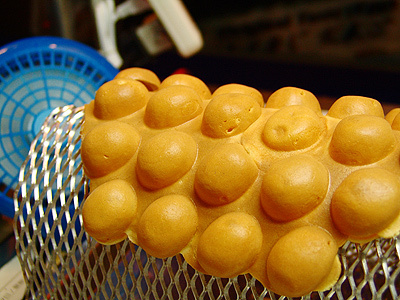 Eggettes are basic egg-puffs that tastes more like pancakes and are served hot and soft. They also have several flavors such as strawberry, chocolate, and coconut. (God, I miss this!) Be sure to try this one out when you get to go to Hong Kong.